Basic objective of this term paper is to Define and Discuss Geometrical Optics. Here briefly discuss on the law of reflection, Plane mirrors, Concave mirrors, Convex mirrors, The law of refraction and Brewster’s angle. 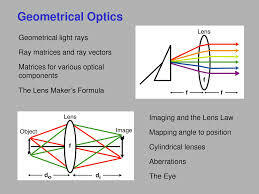 To explain Geometrical Optics here also explain Optical lenses, The compound microscope and Dispersion and prisms.